BELLVILLE — Clear Fork High School, in only its second season as a member of the Mid-Ohio Athletic Conference put together a second-straight undefeated season. The Colts won their second-straight title and are playing for a regional championship Saturday night at Bellfontaine High School vs. St. Mary’s Memorial High School. Clear Fork is 12-0 on the year after a 20-6 win over Bryan in round 1 of the Ohio High School Athletic Association playoffs and a 26-8 win over Lorain Clearview last Saturday. It should not be a surprise to anyone that the Colts have a large presence on this year’s MOAC all-league teams. From Clear Fork High School, Michael Chillemi, Jared Schaefer, Hunter Tollison, Travon Trammell and James Watts were named to the first-team offense. Chillemi, Schaefer and Trammel were also named to the first-team defense, as was Jay Swainhart. Tollison was name to the second team defense, as was Caden Flynn. Flynn also was named to the second-team defensive unit. AJ Blubaugh was named to the honorable mention squad. Clear Fork’s Nathen Wright earned honorable-mention status of the cross country team after placing 15th in the MOAC meet. In golf, the Colts’ Brock Dettmer was name to the all-MOAC first team. In soccer, Clear Fork’s Seth Stoner was name to the first team, Austin Strong and Chase Wortman were named to the second team and Wyatt Strong to the honorable mention team. 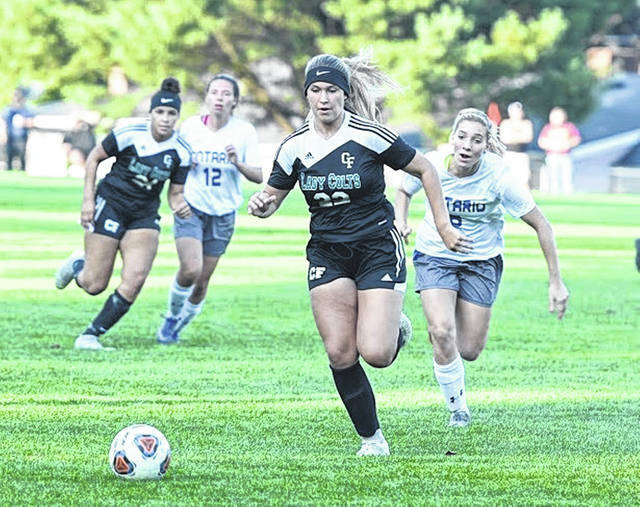 Clear Fork’s girls soccer team went undefeated in league play this year en route to another MOAC titiel. On the first team all-league team were Kaylin Helinski, Kaylee Krausman and Emily Hart. Named to the second team were Mackenzie Thorne and Alli Studenmund and Bailey Romoser is a member of the honorable-mention squad. In golf Tori Skoop was name to the first-team, and Danielle Ousley and Chloey Ferguson to the all-MOAC honorable mention team. And in volleyball, Courtney Weekly was named to the second team, and Kari Weikleto the honorable-mention league team.